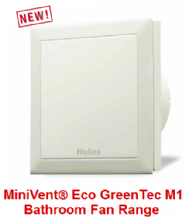 These Helios MiniVent & HelioVent® Mini Fan products are specifically designed for wall & window installations. The new small fans MiniVent® achieve high pressure capacity, maximum energy efficiency & are extremely quiet. The HelioVent® fans are designed to ventilate smaller to mid-sized domestic, commercial & industrial rooms. These attractive 120 mm extract fans offer a volume of up to 47 l/s and a sound level of 13 Watts. The M1/120 fan is a 2 speed fan as standard 28 dB(a). They can be wall or ceiling mounting and are energy efficient consuming only. Draught proof. These attractive 150 mm extract fans offer a volume of up to 72 l/s. and a sound level of 39dB(a). The M1/150 fan is a 2 speed fan as standard. They can be wall or ceiling mounting and are energy efficient consuming only 0.06 Amps. Draught proof with a built in back-draught shutter. Wall extract fan moving a volume of 50 l/s can be fitted into most walls or in the ceiling. 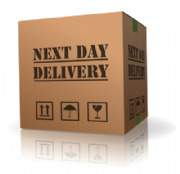 Supplied with an electric shutter to prevent back draught. Quiet yet powerful fans. These attractive 200 mm extract fans offer a volume of up to 125 l/s and can be wall or ceiling mounted. Reversible to give extract or supply. Quiet yet powerful fans.These attractive 250 mm extract fans offer a volume of up to 234 l/s and can be be wall or ceiling mounting. Reversible to give extract or supply. Wall fans for fitting into the the wall such as a standard cavity wall. Offering a simple wall fitting with fan mounted in the wall between the internal and external shutters. These fans benefit from having an internal electric shutter to prevent backdraught when the fan is switched off. Ideal for domestic kitchens to building regulations document F.
Wall fan model WX 225, moving a volume of 248 l/s can be fitted into walls the fittings included. For most standard wall thickness. Supplied complete with an electric shutter, a rain repellent grille and the wall fittings. Wall fan model WX 300, moving a volume of 448 l/s can be fitted into walls the fittings included. For most standard wall thickness. Supplied complete with an electric shutter, a rain repellent grille and the wall fittings.